This incident happened more than a year ago. D had just got down from the school bus one afternoon. Me: wow, are these beans from your school garden? D: no these are cowpea. You have to make curry with it now. And I made a simple cowpea beans thoran (hardly a tsp) and she had it with rice and ghee for lunch that day. She had experienced the garden to plate cycle - right from sowing the seeds, watering the saplings, harvesting the beans to eating a healthy dish. Ever since that day, whenever I make cowpea beans - both the fresh green variety and the dry black eyed beans (lobia/kaaramani) that go into a dal, she eats happily and asks for second or third helping. This second incident happened a few weeks back. D loves idlis and dosas but prefer to eat them ONLY with molagapodi (dry chutney powder mixed with gingelly oil). She wouldn’t touch the chutney. On rare occasions, she would taste tomato chutney but wouldn’t eat any other varieties. One evening, I was about to start making mint chutney to be served with little millet dosas for dinner. D: Amma, I want to help you. Me: Ok, I’m making chutney today. D: I’ll make it. Tell me what to do. Me: Ok, let's add these ingredients to the mixie jar and grind it. I gave her the fried gram dal, coconut, sautéed mint leaves, green chillies and salt one by one. Me: What chutney is this? Can you guess the colour? Needless to say, she ate the dosas with mint chutney for the first time that evening. As parents, we try so hard to feed healthy foods and dishes to our kids. We try many techniques - blackmailing, threatening, offering reward (first eat healthy food, then you'll get junk food), hiding healthy ingredients in junk food and what not. I have also tried many of these techniques but over the years, I have learnt that creating a positive attitude in the minds of children will make them pick a healthy food on their own and eat without any fuss. It minimizes our efforts to constantly think of new ways to feed them healthy. The above two incidents are a proof of that. Even if you don’t have a garden space, grow a few plants in your balcony. Let the kids water the plants, observe the growth and wonder at nature’s miracles. D loves hibiscus flowers. Ever since I told her that hibiscus flowers are good for the heart, she would pluck a flower whenever it blooms and promptly asks me to make hibiscus tea. She offers it to her friends as well. When she catches a cold/cough, she knows that tulsi concoction is the remedy and would pluck a few leaves from the tulsi plant and hand it over to me. 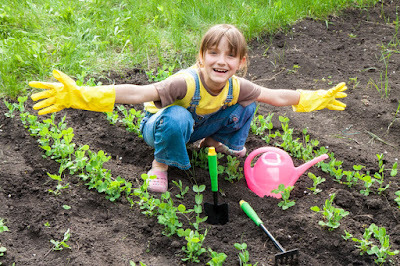 This is extremely important for urban kids, who haven’t seen or experienced how vegetables or fruits grow in farms. We don’t want our children to believe that tomatoes come from supermarkets. The lens with which they view a vegetable on a plant is so different from us - it is a sight of wonder for them, that leads to many questions and new discoveries. Online shopping has made our lives easier but we are losing out on the whole experience of hand-picking fruits from a cart. Children learn quickly using all their senses. A trip to a fruit market will help them see the different colours of fruits, their shapes and textures. They will be more curious to pick their choice of fruits themselves. No coaxing is required to make them eat fruits. 1. Involve D ONLY while I make dinner. When I’m busy during weekday mornings preparing breakfast and lunch quickly, I tell her politely that I’m cooking very fast and she can help me later. 2. Give her specific tasks to do. She likes to chop vegetables, so I give her a butter knife and she chops soft vegetables like capsicum, tomato, garlic etc. She also likes to stir-fry or mix things in a pan. So I bought a couple of spatulas with long handles and I let her use them, with constant supervision of course. It is a matter of pride for her, when she sees “her” capsicum pieces going into the mixed rice or “her” rotis being cooked. “We reap what we sow” - if we want our kids to eat healthy, we need to consciously invest time and effort. It doesn’t take a lot of time, just a little bit of planning and willingness to spend time with kids in such activities.